England had to make Australia work hard on the third day of the third Ashes Test in Perth, but, once again, they failed. From 180-4, the tourists crashed to 251 all out and then saw Australia rack up 235-3, a lead of 369. In the morning session, they had 12 overs to face before the new ball was due, something which was always going to be a vital element to the whole match. One suspected that England might lose one wicket in those 12 overs, but, instead, they lost three and that was that. From then on, it was a familiar story. One of a huge first-innings lead being handed away, of bowlers going back out without enough rest and of Australia's batsmen playing without pressure. "By this stage of a major football tournament a side on the wrong end of successive maulings would be gone before the serious business of the knock-out stage. One bad match is enough to end a tennis player's interest in a Grand Slam; the cut comes as merciful release to the hopelessly out-of-form golfer. Not in cricket. Not on an Ashes tour of Australia, where each additional defeated day serves only to increase the mocking one will receive over the remainder." Heads dropped, stumpings were fluffed and catches were missed. Then, the sight of Stuart Broad appearing on crutches at the end of the day after being hit on the foot by Mitchell Johnson gave the whole thing a calamitous feel. Now, even the most positive are wondering how England are going to avoid a 5-0 whitewash. I usually leave the headline-grabbing predictions to others, but even I am struggling to see how they will not get an absolute caning. How has this happened? How have England gone from winning 3-0 in the summer to surrendering the Ashes in three matches down under? Part of the reason is the way in which they play their cricket. When they are winning, it is hard to criticise. However, at the back of your mind you know that, when things don't go well, there isn't really a plan B.
England are attritional, quite defensive, they talk about "bowling dry". It has worked in the past because of the opposition they have come against and the lifeless pitches they have played on - particularly last summer when they used home advantage to make sure that conditions suited them. But, when they need something different, a situation to be turned around or initiative to be grasped, they seem unable. Another problem with England's brand of cricket is that the opposition do not think much of it, to the extent that they actually get angry about it. That's what has happened here. Australia are smarting about what took place in the summer, they resent the way England operated and the pitches that were prepared. It has added to their determination and made coach Darren Lehmann's job much easier - you sense he has not had to provide one ounce of motivation. You occasionally see flashes of it appear on the pitch, not least through David Warner's outrageous celebration on reaching a hundred. Warner is a very good player and I thoroughly enjoy watching him bat. He's rough and ready, a street fighter and he loves nothing more than being involved in a real tussle. He is just the man that Australia want, one who gets out there and gets amongst England. However, with all that, there is a more unpleasant edge that comes with him, which we saw again in that violent celebration. 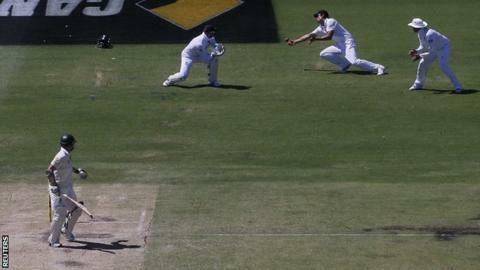 Warner rushed towards Matt Prior, leaping at him. That is not the way you celebrate reaching a Test hundred and he may get punished for it. The bottom line is, though, it was another illustration of how resentful Australia are towards England. The final insult for England was Broad, wearing a protective boot on his right foot and hobbling around on crutches. The results of an MRI scan won't be known until Monday, but, if it's a broken foot, he will be out of the tour. Not only will it be a disappointment for England because Broad has been their best bowler, but also a personal one for him because he has a record of not making it through tours. Hopefully it's only a nasty bruise.